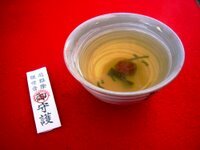 In the early morning of the New Year, before even eating the New Year soup (zooni), a tea was prepared with the first water scooped of the year "young water" (wakamizu 若水). With plenty of tea leaves there were pickled salted plums (umeboshi) and seaweed (musubi konbu), sometimes even some mountain pepper (sanshoo) in the brew. It was drank with the prayer and wish to stay healthy for the rest of the year by all family members and later in the day served to all visitors. This custom dates back to the day of emperor Murakami 村上天皇, when an epidemic raged in the town of Kyoto. Saint Kuya of the temple Rokuharamitsu had a sacred dream to offer some of this tea to main deity, Kannon Bosatsu and thus cured all people. The tea was named oofuku 王服、皇服 and from that day onwards prepared every year. Since the Muromachi period, plums, seaweed and mountain pepper were added. It is served at the temple Rokuharamitsu during the New Year visit (hatsu moode). Salted plums (umeboshi　梅干) promise a long life. Mountain pepper (sanshoo　山椒)lets people walk easily in the mountains. Seaweed (musubi konbu　結び昆布) was a play with words meaning "tie together in harmony". This had all the meaning of good great big luck, daifuku　大福. 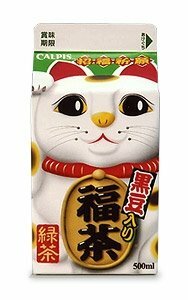 In other areas of Japan, they add sugar or radish or dried persimmones. In some areas, it is drunk also on the seventh and 15th day of January. It is also of course a special event for the Tea Ceremony, where three different kinds of sweets are prepared too. 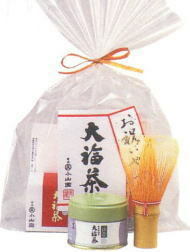 In some areas of Japan, this tea is served for the Setsubun ceremonies in February (see below for Setsubun, the Seasonal Divide). Read about the translation of "o-fukuro" .